Receive maximum ventilation with minimal noise pollution with this Vent-A-Hood under cabinet range hood. The large, inviting canopy allows heat to naturally rise into the hood while the Magic Lung blower system exhausts the smoke and fumes. The sleek, linear style of the stainless steel Professional Series will perfectly match the professional-styled kitchen. 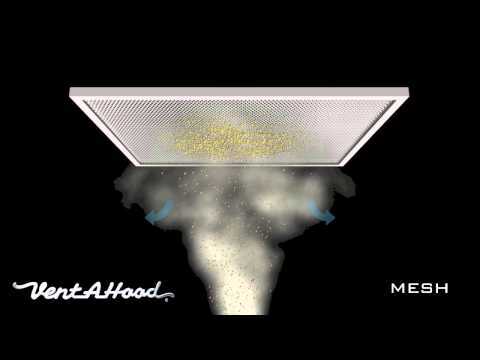 The unique Magic Lung blower system is the heart of every Vent-A-Hood range hood. The patented centrifugal grease extractor collects 99 percent of the grease in the housing, which snaps apart for easy dishwasher cleaning. The centrifugal pressure also prevents fire from entering the duct-work. Because the grease is collected in the blower as opposed to a filter or baffle, there is no obstruction to the air flow, creating a much more efficient air collecting system. This powerful 300 CFM Magic Lung blower works just as hard as equivalent 450 CFM blowers while only registering 5. 4 sones on high speed. This vent hood is equipped with the SensaSource heat sensor, which automatically adjusts the speed of the blower according to the temperature. The 50 watt halogen lights eliminate shadows while cooking and also feature a dual switch for dimming to 25 watts.